On January 17th in 1999, Vancouver Canucks superstar Pavel Bure was traded to the Florida Panthers along with Bret Hedican, Brad Ference, and a third round pick in the 2000 NHL Entry Draft (Robert Fried) in exchange for Ed Jovanovski, Dave Gagner, Mike Brown, Kevin Weekes, and a first round pick in 2000 (Nathan Smith). 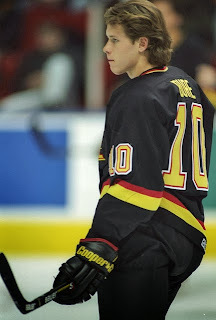 The seeds of the trade were sewn on July 5, 1998 when Bure demanded a trade for personal reasons, later revealed to include alienation by management coupled with several bitter contract negotiations, claiming he would never again play for the club. He didn't and Canucks GM Brian Burke eventually orchestrated a trade with Panthers GM Bryan Murray.